This simple puree of artichoke hearts in broth with a bit of garlic and cream is based on one served at Duarte's Tavern in Pescadero, California—not too far up the coast from the artichoke-growing area around Watsonville and Castroville. I've lightened the amount of cream a bit (okay, a lot!) to bring out more artichoke flavor. You can make it a bit more elegant by adding a full cup of cream, if you like, since it is terribly delicious that way, too. 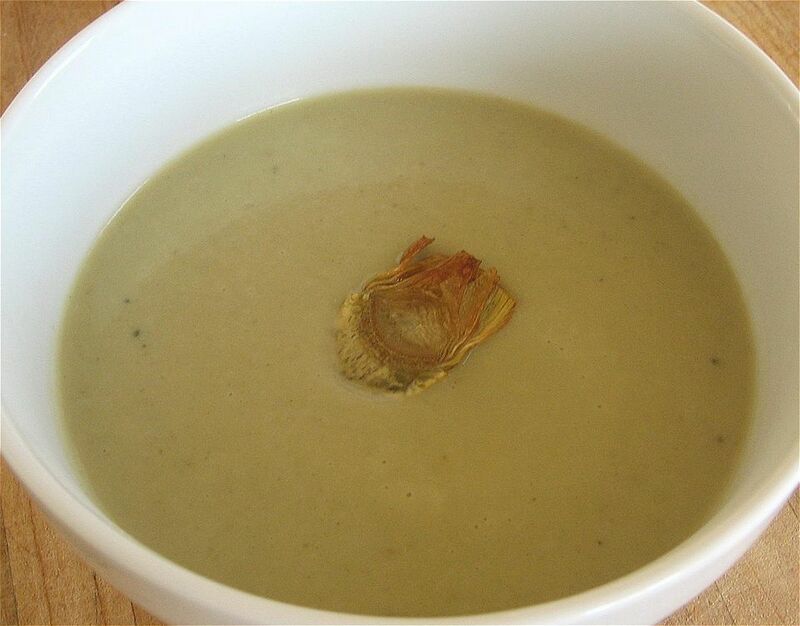 Either way, if you like artichokes, it's one of the tastiest soups imaginable. Never cleaned an artichoke before? Check out How to Clean Artichoke Hearts for a few tips. Note: Avoid the cleaning of the artichokes, or make this out of artichoke season, by using a pound of frozen artichoke hearts, which will most accurately convey the fresh artichoke flavor. Well drained and rinsed canned artichoke hearts can also be used in a pinch, but they will bring a tinny flavor with them that isn't ideal. In a large pot with a tight-fitting lid bring about 1 inch water, lemon juice, and teaspoon salt to a boil. Meanwhile, cut the stems and thorns from the artichokes. Place the trimmed artichokes, stem-side down and standing, in the pot. Cover, reduce heat to medium-low, and cook until a leaf pulls out easily from each artichoke, about 20 minutes. Drain and rinse with cold water. Pull off and discard very dark green, outer leaves from the artichokes. Pull off remaining leaves and set aside. Cut off any fibrous dark green parts around outside of heart. Use a spoon to scrape out the fuzzy choke. Roughly chop the heart and put it in a blender or food processor. Repeat with remaining artichokes. Use a spoon to scrape off tender flesh from each leaf. Discard the scarped leaf and put the artichoke flesh in the blender with the hearts. Repeat with the remaining leaves. In a medium saucepan over medium-high heat melt the butter. Add the garlic and cook, stirring, until fragrant, about 1 minute. Transfer the garlic to the blender with the artichokes. Set the pan aside. Whirl the artichokes with the broth until very smooth. You will need to let the blender run a bit for this to happen; whirl for at least 2 minutes. This will seem like a long time. Stick with it. You're looking for a smoother-than-smooth texture. Transfer the artichoke mixture to a large saucepan. Bring the puree to a boil. Reduce the heat to maintain a steady simmer. Add the cream, and salt and pepper to taste. Cook just to heat the added cream. Serve the soup hot with plenty of crusty bread with which diners can wipe up every single delicious drop of the soup.